This book stands above all other Battletech novels (I know, that's not saying much). Still, it's pretty enjoyable and you don't need to know anything about the universe or the meta-plot to read it. The characters are interesting and the battles don't read like a transcript from a Battletech game. This is the only Battletech novel I would recommend to someone who isn't already a Battletech fan. If the idea of a Black space-samurai piloting a 10-meter tall walking tank sounds awesome to you, you would probably like this book. Absolutely amazing! The characters are really complex and wonderfully written. I can't recommend this book highly enough! I'm generally interested in BT for the Clans and their psycho-culture. The 3025 and Succession War campaigns generally are just grist for the Kerensky mill for me (i.e. this is why you needed Operation Revival).That being said, Charrette's depiction of Minobu Tetsuhara is deceptively good. The novel isn't really about Wolf's Dragoons. It's actually a really good take on the noblest of Inner Sphere warriors set against the Game of Thrones style politics of the Successor Lords and pretenders. Even when you know how the book will end, it's still a very compelling read and develops so much of the DCMS culture beyond the otaku-ness of Stackpole's novels. 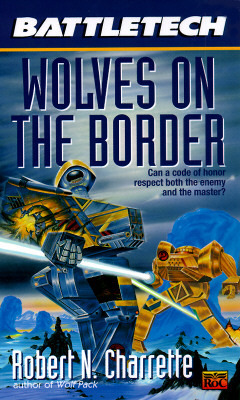 Wolves on the Border is a sci-book written in the Battetech tabletop game universe. Battletech features wars fought with giant robots, and if that is what you are looking for this book will not disappoint. Things this book was good at was providing great descriptions of giant robot combat and showing the politics and combat etiquette of the Battletech universe. There were chunks of the book that felt as though nothing was happening. Also, one critical event in the book is never fully explained. If you want to know more about the Battletech universe this is worth a read. First Battletech novel I ever read. A used copy I found in a bookstore in Saint John. Changed my life. Wolves on the Border appears at first look to be the story of the Wolf's Dragoons contract with the Draconis Combine. But it really is the story of Minobu Tetsuhara and his struggle between Ninjō and Giri. In Minobu's case the conflict is between his honour and the friendship he has with Jaime Wolf, and his duty to Takashi Kurita as an officer in the military.The story slowly ramps up the tension to the ultimate climax. A few spelling mistakes in the printing near the end of the story caused an interruption to the pace which was distracting. But otherwise, this was an entertaining look into the internal politics in the Draconis Combine, and some of the secrets of the Wolf's Dragoons. Perhaps I'm biased given my love of Japan and it's influences so this tale of the Japanese-influenced Draconis Combine and the greatest mercenary band in the Inner Sphere - Wolf's Dragoons - is a shoe-in as one of my favorite Battletech novels.The story is rich and the description of the continuing influence of Japanese culture amidst the feudal yet technological world of the Battletech universe is amazingly well done. Covering the period when Wolfs Dragoons were hired out to the Draconis Combine (3021 to 3028), it shows how a Kuritan warrior, Minobu Tetsuhara gets to know and befriend them, while still staying loyal to his Samurai code.Lots of internal factions within the Kuritans, especially from the Warlord of the system and his aide who have a grudge against Tetsuhara.Plenty of mech action, set against loyalty and duty to ones friends and rulers. I got this book at the FIL (Guadalajara book fair) whithout really knowing anything about BattleTech; they had 2 more books (Spanish translations of the Warrior trilogy; so 1 book missing). I just loved them; regardless that at the time were the most expensive books I had bought. It had places that lost my attention. I put it down for a few months, went back to finish the last 1/4 of the book and really enjoyed it.I want to see if Michi seeks his revenge. I reread this book again after several years. Good introduction to the Dragoons and a great narrative on the epic battle of Misery. Robert N. Charrette - Credited on some German editions as "Robert N. Charette".